WhiteWitch This post is not being displayed . My son took a tumble on his bike yesterday. He says he thinks he slid on a wet grid... Anyway the bike now needs a few things sorting on it. The handlebars are out of whack, possibly bent? I have seen some youtube vids that say looen lower yokes and twist and pull to get them aligned again... I have tried that, but they aren't budging... Anything else I can try? Number plate we can get locally and the other thing was that the speedometer wasn't quite accurate to begin with (maybe the new clocks will sort this issue) do we need a new sensor in the wheel and what is it called/look like. Will we also need to change the speedo cable - this looks tricky to do. I'm tempted to just hand the bike into a garage and say fix it... but they said it would be 2-4wks to sort it out and wait for parts etc... He needs it urgently to get to college. How quickly can you get the parts? Ebay, a week? If the handlebars are bent, fiddling with the yokes won't help, look at them carefully. I would have thought that "clocks" would be a simple replacement. You'll get whatever mileage is displayed on them. You could keep the old ones or note the mileage. Speedo cable ditto. Bars are standard 22mm. You can get some off ebay in a few days. Speedo's are rarely accurate. Using a phone's GPS with one of the may GPS apps out there is a solution the Yoof will already have in the short term. Doesn't work in tunnels though. It's not a sensor in the wheel, it's a mechanical pickup, at least on any YBR I've ever seen. You probably just need a new speedo cable. Clocks are readily available on fleabay as well. Keep the old clock to reassure buyers if you sell it. It's not a big worry, most buyers expect learner bikes to have been slid down the road once or twice. I have a feeling the bars might be slightly bent.. I will fiddle with it and see how it looks. I realised that I hadn't opened the middle yoke haha.. I can't find a spanner big enough for the massive nut! Will have to go in search of one tomorrow. No idea how to change the actual handle bars if they are bent!! Aaah a garage we phoned told us it was a sensor in the wheel and he said it would cost £140isha nd 2wks to fix!! We opted not to leave it with them. Good idea about keeping the clocks for new buyers.. I'll be ebay shopping tomorrow in a big way. Thanks. i'll check ebay for the bars too... one does look a bit bent, but will know more when I can actually straighten them first. I've just been recommended a site called partzilla. No idea if it is any good but will take a look. Teflon-Mike This post is not being displayed . Old Biker Rulze - "You Bend-it.. YOU mend-it"
Why are YOU faffing with this? Send the lad out to deal with his own effups! If he cant find the money, the enthusiasm or the patience to find how-to tutorials to fix a pair of bent handle-bars.. then he obviously isn't so enthusiastic about bikes to begin with, and wont mind catching the bus.... NO! you do NOT have to give him a ruddy lift, you aren't a taxi-driver either! Been there, done that, got the T-shirt covered in oil far too many times; you dive in to 'help' him now, and you will not just make this problem of his, not yours, HIS, yours, you will also make every problem he has here-after yours, and be blamed for everything and anything along the way, from running out of petrol, to getting a flat tyre, to the chain falling off the sprockets, whilst he thrashed the heck out of the thing, having 'fun' and trying to impress college mates, and expecting you to pick up the pieces when he gets it wrong! You have been warned! Help is help! Doing it all for them, isn't! Post script: Yeah.. playing with motorbikes iz 'fun'.... you no got your own? If not Why not? You want fun, go get one! Plenty 'fun' faffing with your own bike to be had; going out on it, thrashing it down back-lanes, or in the garage doing your own maintenance, or adding accessories or doing 'mods'.... and its all your own fun. You do NOT have to mess with some-one elces, especially some-one who likely wont thank you for it, but presume on it, probably when you have more important things to be doing, and this is the twentieth time! My Webby'Tef's-tQ, loads of stuff about my bikes, my Land-Rovers, and the stuff I do with them! We can’t all be miserable unhelpful sods like you teffers. I come from a long line of miserable old sods. Tiz family tradition. I had to suffer it, why shouldn't they? Besides, takes a lot of effort to be this miserable! Often more than doing job myself; Especially watching them attack an M6 bolt head with a 250mm adjustable plumbers wrench, cos they cant find the M6 socket they just put-down, and have kicked the box over ans spread sockets across the lawn!! BUT hands have to be sat on some-times!!!! And speaker magnets removed from the lawn-mower blades and childs chided for the holes in the car doors!... though 10/10 for ingenuity may have to be awarded......... after the bank statement has been forgotten, and they have been made to mow the lawn with nail scissors for a month! c_dug This post is not being displayed . I do sort of see Teffs point, but my TDR250 was off the road for literally months longer than it needed to be because I learned so much whilst mending it (more correctly because I got so much wrong the first time around). Doesn't sound like weeks off the road is an option in this case. I am a bellend, I am a man of constant sorrow, I am a gummy bear, I am a rock. 4 bolts, 2 on each part holding the bars onto the top yoke, circled in red. They then lift off and releases the bars. 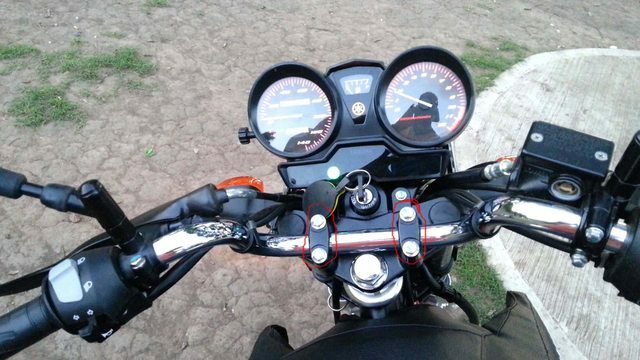 You will need to remove the switchgear, grips, throttle tube etc from the bars before this. Plenty of tutorials and pictures online and youtube etc for those, they're much of a muchness. You won't need to piss around with your stem bolt (the big one) unless something is seriously dodgy, chances are it's the bent bars throwing offf your perception. Replace those first, then see where you are at. Having another look at it, I think it is just the bent bars and broken clocks that made me think the forks were twisted. Hope you can get the bits you need asap OP and thus do the work to get your lads bike back on the road. Its actually nice in 2018 to read about people having and running a bike as a necessary evil for A-B transport or to get to work to earn a wage. EBay, Wemoto, and used bike dealers might have most of what you need. Also look out for any dead bikes local that could be used as a donor for parts. Unlike Teff, I do actually disagree with kids messing with their own bikes and doing maintenance. Apart from the few hands on mechanical minded types or ones who work in engineering or industry, most never picked up a spanner kids won't have a clue, and it's not a simple generic skill to teach them mechanics like it is decorating etc. There's barriers and limitations to learning how to fix and work on modern bikes/cars unless your in that line of business or work in a dealer/shop where you have access to all the modern diagnostic equipment etc. I don't think changing handlebars, or oil for that matter, has changed much for the last 100 years! All you need to know is leftie loosey righty tighty as a start. I don't think I knew all that much more (ok, slightly tongue in cheek, but honestly we don't expect yoot to learn anything for themselves these days. We're talking basic nuts and bolts stuff here). What will happen if I put clocks on the bike that "aren't suitable for fuel injection bikes"? Will it just not work? The Older/Chinese clocks do work. I put a set on mine when it got nicked and they smashed up the whole front end in a pathetic attempt to hotwire it. The older clocks haven't got the FI/Management light, which you only need if there's a problem. You can hear the pump prime without need for a light. The fuel gauge will be at the bottom on the older clocks. Maybe get the kiddo to help you replace stuff? That way they learn as well as get the bike fixed. Mr/Mrs Witch, it might be a good idea to get A workshop manual for this bike. If you and your son are going to keep this bike, you will find a lot of useful information in the book. I am sure Haynes do a manual for that bike. Oh yeah he will be helping. He needs to learn how to do it. He is fast approaching 18yrs old and is a good lad. Doing well in college, has a job, helps out with younger siblings when needed. I don't mind helping him out and am not about to just leave him to it. He is paying for most of the repairs, but I'm helping out as he spent pretty much his entire wage on the bike and bike gear. He skidded off it on his 3rd outing out on it, which just happened to be his first day back at college. He didn't go to college as he has mashed his knee up quite badly. Typically the only safety gear he hadn't bought was trousers, as he was hoping to get by for a month and buy them next payday. I will just get some of the cheaper clocks and stick them on then. Not bothered about engine management lol. It is a proper learner bike for him and as long as it runs it's good enough. His dad has just bought a bike (after not having one for the last few years) but he never really got into fixing them much, just sent it to the local bike garage (run by Jenny Tinmouth) and had them do anything that needed doing. He had a Hornet, then a Fireblade, and this time a Blackbird (he likes his Hondas) but I think this time he wants to learn how to look after it himself a bit more. We'll all be mucking in together to get the lads bike back on the road and learning how to do more than an oil change to his own bike lol. Thanks for all your help guys it is much appreciated. I've ordered the bars, speedo cable, new grips and will do the clocks. Hopefully that will sort it. I'll take him the local place to get the number plate. So proud of the lad today. He spent all evening outside fixing his bike. He has changed the handlebars, the clocks and the speedo cable. The new grips are here yet, so we're waiting for them and we still need to get a new number plate. He did most of it on his own, with only minimal input from me. Unfortunately the indicators don't seem to be working quite right?? The left works, but the light on the clocks stays on all the time, but does flash when turned on. The right seem totally screwed up. The front indicator wont' do anything and the back just lights up but doesn't flash..
Actually, one question, are the indicators an exact replacement or are they aftermarket? If the latter, post a link to them, it'll probably help diagnose the issue. He's learning. Good. One issue? That's pretty good for a total newbie. Unfortunately the indicators don't seem to be working quite right?? Go through and inspect the wiring for the indicators. Sounds like something is loose/damaged/not connected. Probably a ground. They use Y bullet connectors, Left and right sides have the grounds for front and back into one Y connector. The positives are separate (Green and Brown off the top of my head, it's been a while). Make sure the females are nice and tight around the males, no flapping around and making a bad or intermittent connection. THIS is probably where I have been going wrong, my whole life! Ah well looks like things aren't going as well as we hoped. Grips came today, so put the right one on, but revometer not working. It is probably because it is a non-fuel injection one I bought (hoping it would work) as I can't find any 2nd hand ones from a fuel injection bike. Can't work out why the indicators are paying up. Left work fine, but right still not working properly. We'll have another go at it, but I think we might be sticking it in a garage as it is starting to cause stress now. It's item no. 372434402147. Seventy squiddicks though, might take an offer. Thanks, I did see that one, but it is a 2013 model and looks totally different to the original one on my son's bike (his is an 09 bike).